The renal veins are veins that drain the kidney. They connect the kidney to the inferior vena cava. They carry the blood filtered by the kidney. The anterior surfaces of the kidneys, showing the areas of contact of neighboring viscera. the posterior branch which receives blood from the posterior portion. Because the inferior vena cava is on the right half of the body, the left renal vein is generally the longer of the two. This is in contrast to the right side of the body, where these veins drain directly into the IVC. Often, each renal vein will have a branch that receives blood from the ureter. 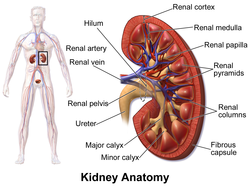 It is usually singular to each kidney, except in the condition "multiple renal veins". In some people the left renal vein passes behind the abdominal aorta instead of in front of it, this is termed a retroaortic left renal vein, which is also known as "The Vein of Schnitker." If there is both a vein passing in front of and one behind the aorta this is called a circumaortic renal vein. Diseases associated with the renal vein include renal vein thrombosis (RVT) and nutcracker syndrome (renal vein entrapment syndrome). Human kidneys viewed from behind with spine removed. ^ "Multiple renal veins". Medcyclopaedia. GE. Archived from the original on 2012-02-05. Anatomy figure: 40:06-05 at Human Anatomy Online, SUNY Downstate Medical Center - "Retroperitoneal structures on the posterior abdominal wall."